UPDATED: Wed., Dec. 13, 2017, 3:01 p.m.
ORLANDO, Fla. – For so many years – a decade, actually – any prognosis for the Mariners’ season began with one reassuring certainty: Felix Hernandez would be the stalwart ace around which the team could build (or rebuild), even if everything around him crumbled. Amid all kinds of turmoil and underachievement, at least you could count on Felix to provide 200-plus innings of bliss. For the past two seasons, that notion held firm more out of habit and wishful thinking, even as injuries and wear-and-tear made it increasingly clear the King’s dominance no longer was a sure thing. Now, finally, the Mariners and their fans are facing the stark reality of life at age 32 (shortly after opening day) for Hernandez, with 2,500 innings of workload on his stat line. When club officials talk about the potential for a shutdown No. 1 starter, it’s likelier James Paxton is the subject. Don’t get me wrong – no one is writing off Hernandez, by any means. At the winter meetings, both general manager Jerry Dipoto and manager Scott Servais spoke of their belief in the possibility of a rebound by Hernandez. If I were to rate the players upon whom the Mariners’ hopes for playoff contention in 2018 rests, I’d put Hernandez at the top of the list. After missing six weeks because of a calf injury in 2016 and spending two long stints on the disabled list in 2017 because of shoulder issues (and not pitching at his typical caliber when he was healthy), the Mariners absolutely need a revived Hernandez to take his regular turn. That holds particularly true if the Mariners go with the possible rotation Servais talked about Tuesday – Paxton, Hernandez, Mike Leake, Erasmo Ramirez and Marco Gonzales. But there has been a subtle shift in the assessments of Hernandez that involve a recognition he simply is not the overpowering pitcher he used to be, and most likely never will be. That narrative is not a new one, of course, but it always was accompanied, perhaps even tacitly, by the belief (or yearning) that through guile or a reassessment of his pitching style and/or mindset, Hernandez still could find a way to do the things aces do. Now it seems as if there has been a paradigm shift. The Mariners know they can hope for the best from Hernandez, but they can’t expect it as a given. It will depend on how his body holds up and how his mind wraps around the reality of his diminishing toolbox. 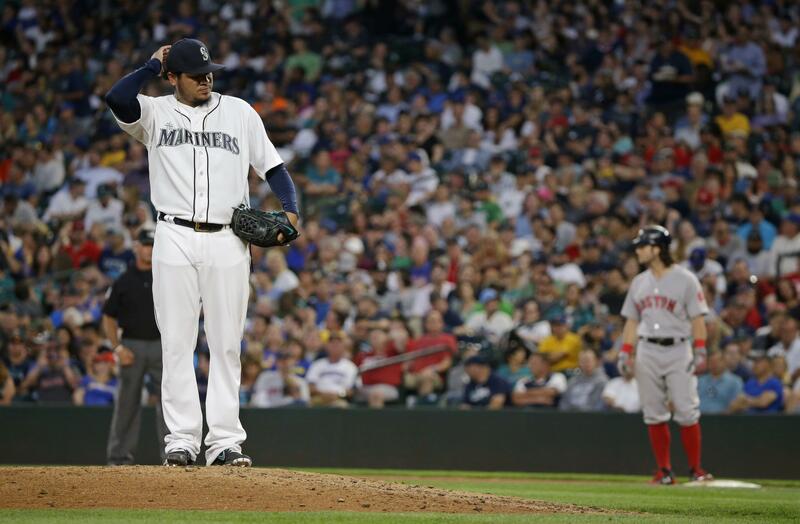 “Everybody knows Felix has maybe taken a step back in the velocity of the fastball,” Servais said. “He has not lost his know-how, his feel to pitch, his competitiveness is all still there, and that’s what we need. If Felix can give us 30, 32 starts this year, he’ll put up his numbers and we’ll be just fine. Since bursting into the big leagues in 2005, all speed and bluster, Hernandez has played for eight managers in Seattle. Servais is the first who has not seen him at the top of his game on a consistent basis. “No, I haven’t,” he admitted. “Just looking from afar before I got the opportunity here in Seattle, I was so looking forward … you’re looking for that guy to anchor down your rotation, the guy you give the ball to, and we can take a deep breath here. We’ve started to see James Paxton be that guy. I haven’t seen it out of Felix yet. It’s there. We’ve seen it for a game here, a game there, but there’s nobody more competitive that wants the ball and wants to take the ball and produce for the Mariners. Last year, challenged by Servais at the end of 2016 to get in better shape and driven by pitching for Venezuela in the World Baseball Classic in early March, Hernandez got perhaps too bulky from his heavy weight regimen over the winter. Dipoto said Hernandez and then-trainer Rick Griffin felt he became too big in the shoulders; the focus this offseason has been on getting more flexibility and mobility. Now Hernandez needs to show he can still be in good form, despite the ravages of age. Servais believes Hernandez finally might have had an epiphany in his final start of the year Sept. 25 against Oakland, in which he worked six innings, gave up two hits and limited the Athletics to one run in a 7-1 Mariners victory. Hernandez struck out just two but found a way to win without blowing it by the Oakland hitters. That’s hardly the rallying cry we’re used to for the King, who has a Cy Young, a perfect game, two ERA crowns and six 200-strikeout seasons on his résumé. And yet in 2018, it might be the best-case scenario for Felix Hernandez. Published: Dec. 13, 2017, 2:54 p.m. Updated: Dec. 13, 2017, 3:01 p.m.